A lot of companies are struggling to adjust to the new way of things, and while the USPS is bad, they look like progressives next to your average record company. For example, consider the case of “This Too Shall Pass.” It’s the first single off the latest OK Go album, Of the Blue Colour of the Sky. 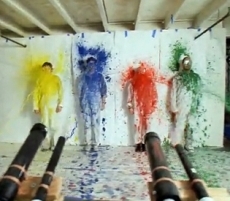 OK Go rose to fame on the strength of their incredible video for “Here It Goes Again” which quickly became one of the biggest viral videos on the Internet thanks to the band’s inventive use of treadmills. That’s why nobody was angrier than the band when EMI (their record company) prevented their newest video from being used in webpages. However, thanks to the band’s own indignation and lots and lots of fan support, OK Go has finally gotten the permission to release an embeddable video. The results are excellent, as you might expect. The new version of This Too Shall Pass, directed by James Frost, Syyn Labs, and OK Go, features one of the coolest Rube Goldberg machines I’ve ever seen. Check it out!